The Bell X-2 was an extension of the X-1 testing envelope, this time designed to push into Mach 3. A completely new design, the X-2 was designed before the X-1 had even flown, and by the time the X-2 was built, the desire to explore faster speeds and higher altitudes was high. For an excellent history of the X-2, I strongly recommend reading "A Shadow over the Horizon," by Robert W. Kempel. 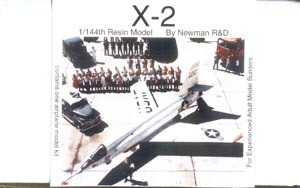 Originally printed in the Spring 2003 issue of the American Aviation Historical Society Journal, it has been reprinted online at the Bell X-2 website. 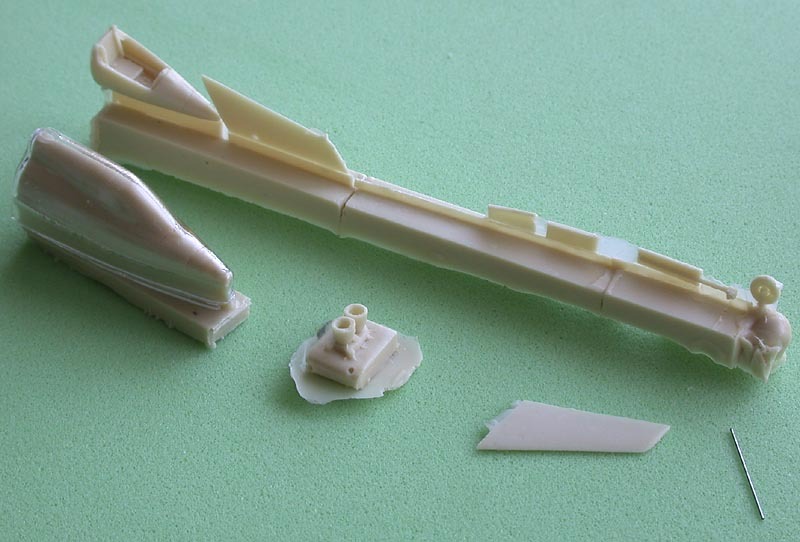 The people at Muroc Models have been known for producing simple yet detailed resin kits, and with this new X-2 kit they continue that tradition. Molded in tan resin, this kit has a total of eight pieces, with a single vacuformed canopy. This limited number of parts by no means indicates a lack of detail, as the kit also comes with a nearly complete interior (all that is needed is a control stick). The decals are very nicely done as well, but more on that later. The breakdown of the parts is designed in such a way as to make construction very simple. The nose is separate at the rear cockpit bulkhead, and a quick test-fit shows that it will have an almost perfect fit. The main fuselage incorporates the wings and vertical tail, leaving only the horizontal stabilizers, landing gear, and rocket nozzles as separate pieces. With care, this model could be assembled and ready for paint in an afternoon. What might slow things down a bit, though, is the cockpit. This is open, with detailed decals for the instrument panel and side consoles, as well as for the seat cushions. Interestingly, the instructions state that it is uncertain just what the interior was painted (either interior green or gray or perhaps some other color). I would have thought that the interior of this plane would have been well documented, but apparently that is not the case. At any rate, once you pick your color and apply the decals, you will have a very nice looking interior for such a small model. The vacuformed canopy comes with a resin plug to help prevent it from being crushed in packaging. This is a very nice touch and I wish other companies would catch on to that. It also provides a very solid base to trim the canopy Also of interest regarding the canopy is the innovative method for masking it. The folks at Muroc Models have provided a decal to mask it with. This is an ALPS-printed decal and they suggest rinsing off most of the adhesive, then applying the decal. Once painting is complete, a piece of tape is used to pull up the decal. It will be interesting to see how well this works. 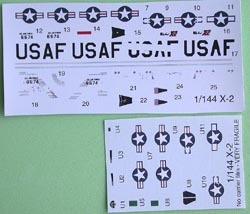 Speaking of decals, finishing the X-2 is going to be pretty simple, thanks to the extra effort put into the decals. Like I mentioned earlier, the decals are ALPS-printed, which means that we have excellent metallic representation here. But wait, you say, the X-2 was painted white! Yes, it was, and the instructions have you paint the airframe white. Additionally, there are some small detail areas that you will need to paint, such as a red wingtip and the bare metal rear section. Where the silver decals come into play, though, is with the representation of the chipped paint as seen in September 1956. 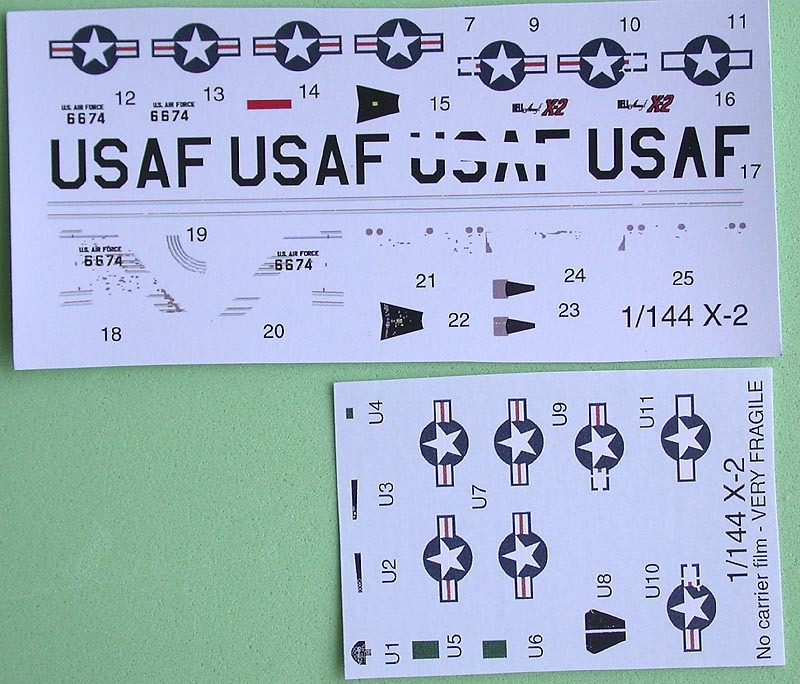 The decal artist has gone to great lengths to meticulously lay out all of the areas of chipped paint, resulting in a very realistic finish. With all of that effort, I cannot imagine anyone building this kit and not using those decals. But for those who prefer a pristine example, the decal sheet includes plenty of extra striping to apply on the tail, sans silver chipping. This is truly an outstanding kit of the X-2. Its small scale should in no way deter modelers that yearn for detail, as this kit has lots of it. I look forward to building this kit both for its simple construction and weathered appearance. 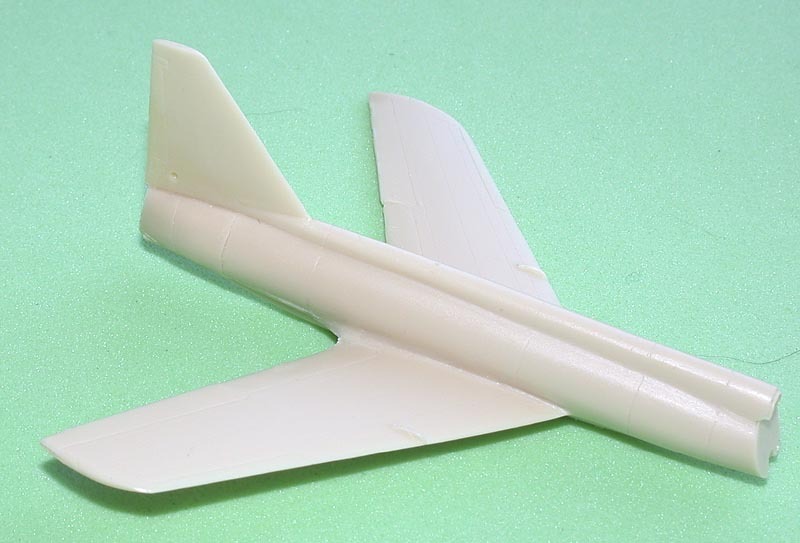 I guess I'll have to get going on my 1/144 B-50 as well. All I'd have to do is take a Minicraft Boeing 377 and use the tail and wings on a Minicraft B-29, right? My thanks to Muroc Models for the review sample. Muroc Models are available from the AFFTC Museum gift shop. Contact Doug Nelson, Director, AFFTC Museum, phone: (661) 277-8050 for ordering information.